If you needed proof that the electric vehicle revolution is well and truly underway, you just have to take a look at the recent releases and announcements from the major premium players. First we had Jaguar's Tesla-punishing I-Pace, with its 298-mile official range and eye-swivelling styling, then Mercedes-Benz announced its gargantuan EQC model that can accelerate from 0-60mph in 4.9 seconds and will go on sale in 2019. 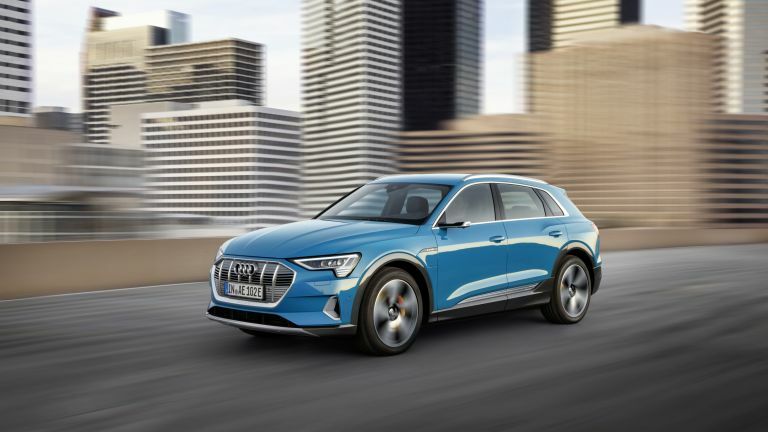 Now Audi, the other German giant, is busy flexing its automotive muscle with the unveiling of its e-tron SUV - the first standalone all-electric model from Ingolstadt that can cruise for 248-miles on a single charge and will open the floodgates for 12 new electric Audis by the year 2025. Based on the Volkswagen Group's MEB platform, which is used for a number of electric models from Volkswagen and Skoda, the new e-tron packs a dual motor system that sees an electric drive unit bolted to each axle. Better still, because the power distribution can be constantly altered by clever onboard software, drivers can make the most of Audi's drive select system to alter the characteristics of the car on the fly. At up to 0.3 g of deceleration, which is up to 90 per cent of any given journey, the electric SUV recuperates solely via the electric motors, with the wheel brakes only called into play when the driver decelerates by more than 0.3 g using the brake pedal - a first for any manufacturer. The tangible result of such technology was demonstrated at the punishing Pikes Peak race recently, where Audi managed recuperate nearly 19-miles of the e-tron's range just by coasting down from the 14,000ft summit. Aerodynamic efficiency only really means anything to car boffins and those that want to eke every single mile from a tank of fuel but in electric vehicles, where so many external factors can effect battery range, aero means everything. That's why Audi has ditched standard wing mirrors for small cameras that transmit a live video feed to interactive OLED screens mounted on the front door panels. Inside, customers are greeted by two large MMI touchscreens that make up most of the cockpit and replace pretty much every conventional switch and dial, while those that enjoy their retinas sizzled by digital information can choose to specify the optional Audi virtual cockpit that is now ubiquitous across its range. Connectivity is also a major buzzword here, with an on-board SIM card allowing constant updates from the web and intelligent route planning that can highlight charging points on the journey. Plus, the system considers the traffic situation and includes the required charging time in its arrival time calculation. While we're on the subject of charging time, expect the e-tron's 95kWh batteries to take around 8.5 hours to top up via Audi's neat compact 11kW home charging adaptor, or 4.5 hours using a chunkier 22kW home system. But perhaps the most pertinent news for owners is that Audi will offer a subscription service that makes accessing and using over 72,000 charging points in Europe much simpler. This package will be billed monthly via the MyAudi app and sees an Audi RFID card or QR code activate numerous charging points from various providers, which puts an end to the painful experience of signing up, maintaining and keeping track of the numerous subscription packages required for pain-free EV travel. Audi claims that services like Uber and Lyft have completely changed the way customers buy and use cars, with a recent study revealing that almost 250,000 ride-sharing service users in the USA completely ditched their cars for the more flexible, app-based transport in 2018. As a result, Audi will focus its attention on mobility and short term rental schemes, which will see cars delivered to users on an 'on-demand' basis. Matt Carpenter, VP for Audi America, says that in the not-so distant future, a large amount of customers won't actually own an Audi but will instead continually swap cars depending on their needs. "A customer might want to use an R8 for the weekend, or make use of the e-tron during the week when they have school runs and kids to ferry around," he explains. On top of this, Audi plans to offer certain functions as 'unlockable' upgrades across its electric vehicle range through the next generation of its connected apps. As with current in-app purchases, future owners and rental customers will be able to unlock more power from the electric powertrain, upgrade the LED headlights to Matrix LED headlights and add infotainment extras, such as DAB+ digital radio, with the swipe on a smartphone app.